This article is about the film processing trademark. For the parent company of the same name, see Technicolor SA. For other uses, see Technicolor (disambiguation). Technicolor is a series of color motion picture processes, the first version dating to 1916, and followed by improved versions over several decades. It was the second major color process, after Britain's Kinemacolor, and the most widely used color process in Hollywood from 1922 to 1952. Technicolor became known and celebrated for its highly saturated color, and was initially most commonly used for filming musicals such as The Wizard of Oz (1939) and Down Argentine Way (1940), costume pictures such as The Adventures of Robin Hood (1938) and Gone with the Wind (1939), and animated films such as Snow White and the Seven Dwarfs (1937), Gulliver's Travels (1939), and Fantasia (1940). As the technology matured it was also used for less spectacular dramas and comedies. Occasionally, even a film noir—such as Leave Her to Heaven (1945) or Niagara (1953)—was filmed in Technicolor. 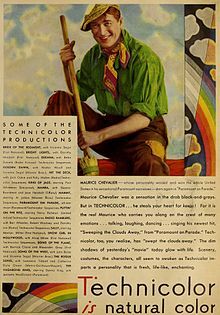 "Technicolor" is the trademark for a series of color motion picture processes pioneered by Technicolor Motion Picture Corporation (a subsidiary of Technicolor, Inc.), now a division of the French company Technicolor SA. The Technicolor Motion Picture Corporation was founded in Boston in 1914 (incorporated in Maine in 1915) by Herbert Kalmus, Daniel Frost Comstock, and W. Burton Wescott. The "Tech" in the company's name was inspired by the Massachusetts Institute of Technology, where both Kalmus and Comstock received their undergraduate degrees and were later instructors. Technicolor, Inc. was chartered in Delaware in 1921. Most of Technicolor's early patents were taken out by Comstock and Wescott, while Kalmus served primarily as the company's president and chief executive officer. Technicolor originally existed in a two-color (red and green) system. In Process 1 (1916), a prism beam-splitter behind the camera lens exposed two consecutive frames of a single strip of black-and-white negative film simultaneously, one behind a red filter, the other behind a green filter. Because two frames were being exposed at the same time, the film had to be photographed and projected at twice the normal speed. Exhibition required a special projector with two apertures (one with a red filter and the other with a green filter), two lenses, and an adjustable prism that aligned the two images on the screen. The results were first demonstrated to members of the American Institute of Mining Engineers in New York on February 21, 1917. Technicolor itself produced the only movie made in Process 1, The Gulf Between, which had a limited tour of Eastern cities, beginning with Boston and New York on September 13, 1917, primarily to interest motion picture producers and exhibitors in color. The near-constant need for a technician to adjust the projection alignment doomed this additive color process. Only a few frames of The Gulf Between, showing star Grace Darmond, are known to exist today. Convinced that there was no future in additive color processes, Comstock, Wescott, and Kalmus focused their attention on subtractive color processes. This culminated in what would eventually be known as Process 2 (1922) (in the later 1900s commonly called by the misnomer, "two-strip Technicolor"). As before, the special Technicolor camera used a beam-splitter that simultaneously exposed two consecutive frames of a single strip of black-and-white film, one behind a green filter and one behind a red filter. The difference was that the two-component negative was now used to produce a subtractive color print. Because the colors were physically present in the print, no special projection equipment was required and the correct registration of the two images did not depend on the skill of the projectionist. The frames exposed behind the green filter were printed on one strip of black-and-white film, and the frames exposed behind the red filter were printed on another strip. After development, each print was toned to a color nearly complementary to that of the filter: orange-red for the green-filtered images, cyan-green for the red-filtered ones. Unlike tinting, which adds a uniform veil of color to the entire image, toning chemically replaces the black-and-white silver image with transparent coloring matter, so that the highlights remain clear (or nearly so), dark areas are strongly colored, and intermediate tones are colored proportionally. The two prints, made on film stock half the thickness of regular film, were then cemented together back to back to create a projection print. The Toll of the Sea, which debuted on November 26, 1922, used Process 2 and was the first general-release film in Technicolor. Frame enlargement of a Technicolor segment from The Phantom of the Opera (1925). The film was one of the earliest uses of the process on interior sets, and demonstrated its versatility. The second all-color feature in Process 2 Technicolor, Wanderer of the Wasteland, was released in 1924. Process 2 was also used for color sequences in such major motion pictures as The Ten Commandments (1923), The Phantom of the Opera (1925), and Ben-Hur (1925). Douglas Fairbanks' The Black Pirate (1926) was the third all-color Process 2 feature. Although successful commercially, Process 2 was plagued with technical problems. Because the images on the two sides of the print were not in the same plane, both could not be perfectly in focus at the same time. The significance of this depended on the depth of focus of the projection optics. Much more serious was a problem with cupping. Films in general tended to become somewhat cupped after repeated use: every time a film was projected, each frame in turn was heated by the intense light in the projection gate, causing it to bulge slightly; after it had passed through the gate, it cooled and the bulge subsided, but not quite completely. It was found that the cemented prints were not only very prone to cupping, but that the direction of cupping would suddenly and randomly change from back to front or vice versa, so that even the most attentive projectionist could not prevent the image from temporarily popping out of focus whenever the cupping direction changed. Technicolor had to supply new prints so the cupped ones could be shipped to their Boston laboratory for flattening, after which they could be put back into service, at least for a while. The presence of image layers on both surfaces made the prints especially vulnerable to scratching, and because the scratches were vividly colored they were very noticeable. Splicing a Process 2 print without special attention to its unusual laminated construction was apt to result in a weak splice that would fail as it passed through the projector. Even before these problems became apparent, Technicolor regarded this cemented print approach as a stopgap and was already at work developing an improved process. Based on the same dye-transfer technique first applied to motion pictures in 1916 by Max Handschiegl, Technicolor Process 3 (1928) was developed to eliminate the projection print made of double-cemented prints in favor of a print created by dye imbibition. The Technicolor camera for Process 3 was identical to that for Process 2, simultaneously photographing two consecutive frames of a black-and-white film behind red and green filters. In the lab, skip-frame printing was used to sort the alternating color-record frames on the camera negative into two series of contiguous frames, the red-filtered frames being printed onto one strip of specially prepared "matrix" film and the green-filtered frames onto another. After processing, the gelatin of the matrix film's emulsion was left proportionally hardened, being hardest and least soluble where it had been most strongly exposed to light. The unhardened fraction was then washed away. The result was two strips of relief images consisting of hardened gelatin, thickest in the areas corresponding to the clearest, least-exposed areas of the negative. To make each final color print, the matrix films were soaked in dye baths of colors nominally complementary to those of the camera filters: the strip made from red-filtered frames was dyed cyan-green and the strip made from green-filtered frames was dyed orange-red. The thicker the gelatin in each area of a frame, the more dye it absorbed. Each matrix in turn was pressed into contact with a plain gelatin-coated strip of film known as the "blank" and the gelatin "imbibed" the dye from the matrix. A mordant made from deacetylated chitin was applied to the blank before printing, to prevent the dyes from migrating or "bleeding" after they were absorbed. Dye imbibition was not suitable for printing optical soundtracks, which required very high resolution, so when making prints for sound-on-film systems the "blank" film was a conventional black-and-white film stock on which the soundtrack, as well as frame lines, had been printed in the ordinary way prior to the dye transfer operation. The first feature made entirely in the Technicolor Process 3 was The Viking (1928), which had a synchronized score and sound effects. Redskin (1929), with a synchronized score, and The Mysterious Island (1929), a part-talkie, were photographed almost entirely in this process also but included some sequences in black and white. The following talkies were made entirely – or almost entirely – in Technicolor Process 3: On with the Show! (1929) (the first all-talking color feature), Gold Diggers of Broadway (1929), The Show of Shows (1929), Sally (1929), The Vagabond King (1930), Follow Thru (1930), Golden Dawn (1930), Hold Everything (1930), The Rogue Song (1930), Song of the Flame (1930), Song of the West (1930), The Life of the Party (1930), Sweet Kitty Bellairs (1930), Bride of the Regiment (1930), Mamba (1930), Whoopee! (1930), King of Jazz (1930), Under a Texas Moon (1930), Bright Lights (1930), Viennese Nights (1930), Woman Hungry (1931), Kiss Me Again (1931) and Fifty Million Frenchmen (1931). In addition, scores of features were released with Technicolor sequences. Numerous short subjects were also photographed in Technicolor Process 3, including the first color sound cartoons by producers such as Ub Iwerks and Walter Lantz. Song of the Flame became the first color movie to use a widescreen process (using a system known as Vitascope, which used 65mm film). In 1931, an improvement of Technicolor Process 3 was developed which removed grain from the Technicolor film, resulting in more vivid and vibrant colors. This process was first used on a Radio Picture entitled The Runaround (1931). The new process not only improved the color but also removed specks (that looked like bugs) from the screen, which had previously blurred outlines and lowered visibility. This new improvement along with a reduction in cost (from 8.85 cents to 7 cents per foot) led to a new color revival. Warner Bros. took the lead once again by producing three features (out of an announced plan for six features): Manhattan Parade (1932), Doctor X (1932) and Mystery of the Wax Museum (1933). Radio Pictures followed by announcing plans to make four more features in the new process. Only one of these, Fanny Foley Herself (1931), was actually produced. Although Paramount Pictures announced plans to make eight features and Metro-Goldwyn-Mayer promised two color features, these never materialized. This may have been the result of the lukewarm reception to these new color pictures by the public. Two independently produced features were also made with this improved Technicolor process: Legong: Dance of the Virgins (1934) and Kliou the Tiger (1935). Very few of the original camera negatives of movies made in Technicolor Process 2 or 3 survive. In the late 1940s, most were discarded from storage at Technicolor in a space-clearing move, after the studios declined to reclaim the materials. Original Technicolor prints that survived into the 1950s were often used to make black-and-white prints for television and simply discarded thereafter. This explains why so many early color films exist today solely in black and white. Warner Bros., which had vaulted from a minor exhibitor to a major studio with its introduction of the talkies, incorporated Technicolor's printing to enhance its films. Other producers followed Warner Bros.' example by making features in color, with either Technicolor, or one of its competitors, such as Brewster Color and Multicolor (later Cinecolor). Consequently, the introduction of color did not increase the number of moviegoers to the point where it was economical. This and the Great Depression severely strained the finances of the movie studios and spelled the end of Technicolor's first financial successes. Ending card for a 1936 Warner Bros. Merrie Melodies cartoon with an "In Technicolor" credit. Many animation companies during the 1930s and 1940s used Technicolor for their cartoon shorts. Technicolor envisioned a full-color process as early as 1924 and was actively developing such a process by 1929. Hollywood made so much use of Technicolor in 1929 and 1930 that many believed the feature film industry would soon be turning out color films exclusively. By 1931, however, the Great Depression took its toll on the movie industry, which began to cut back on expenses. The production of color films had decreased dramatically by 1932, when Burton Wescott and Joseph A. Ball completed work on a new three-color movie camera. Technicolor could now promise studios a full range of colors, as opposed to the limited red-green spectrum of previous films. The new camera simultaneously exposed three strips of black-and-white film, each of which recorded a different color of the spectrum. The new process would last until the last Technicolor feature film was produced in 1955. Technicolor's advantage over most early natural-color processes was that it was a subtractive synthesis rather than an additive one: unlike the additive Kinemacolor and Chronochrome processes, Technicolor prints did not require any special projection equipment. Unlike the additive Dufaycolor process, the projected image was not dimmed by a light-absorbing and obtrusive mosaic color filter layer. Very importantly, compared to competing subtractive systems, Technicolor offered the best balance between high image quality and speed of printing. The Technicolor Process 4 camera, manufactured to Technicolor's detailed specifications by Mitchell Camera Corporation, contained color filters, a beam splitter consisting of a partially reflecting surface inside a split-cube prism, and three separate rolls of black-and-white film (hence the "three-strip" designation). The beam splitter allowed ⅓ of the light coming through the camera lens to pass through the reflector and a green filter and form an image on one of the strips, which therefore recorded only the green-dominated third of the spectrum. The other ⅔ was reflected sideways by the mirror and passed through a magenta filter, which absorbed green light and allowed only the red and blue thirds of the spectrum to pass. Behind this filter were the other two strips of film, their emulsions pressed into contact face to face. The front film was a red-blind orthochromatic type that recorded only the blue light. On the surface of its emulsion was a red-orange coating that prevented blue light from continuing on to the red-sensitive panchromatic emulsion of the film behind it, which therefore recorded only the red-dominated third of the spectrum. Each of the three resulting negatives was printed onto a special matrix film. After processing, each matrix was a nearly invisible representation of the series of film frames as gelatin reliefs, thickest (and most absorbent) where each image was darkest and thinnest where it was lightest. Each matrix was soaked in a dye complementary to the color of light recorded by the negative printed on it: cyan for red, magenta for green, and yellow for blue (see also: CMYK color model for a technical discussion of color printing). A single clear strip of black-and-white film with the soundtrack and frame lines printed in advance was first treated with a mordant solution and then brought into contact with each of the three dye-loaded matrix films in turn, building up the complete color image. Each dye was absorbed, or imbibed, by the gelatin coating on the receiving strip rather than simply deposited onto its surface, hence the term "dye imbibition". Strictly speaking, this is a mechanical printing process, very loosely comparable to offset printing or lithography, and not a photographic one, as the actual printing does not involve a chemical change caused by exposure to light. During the early years of the process, the receiver film was preprinted with a 50% black-and-white image derived from the green strip, the so-called Key, or K, record. This procedure was used largely to cover up fine edges in the picture where colors would mix unrealistically (also known as fringing). This additional black increased the contrast of the final print and concealed any fringing. However, overall colorfulness was compromised as a result. In 1944, Technicolor had improved the process to make up for these shortcomings and the K record was, thence, eliminated. Kalmus convinced Walt Disney to shoot one of his Silly Symphony cartoons, Flowers and Trees (1932), in Process 4, the new "three-strip" process. Seeing the potential in full-color Technicolor, Disney negotiated an exclusive contract for the use of the process that extended to September 1935. Other animation producers, such as the Fleischer Studios and the Ub Iwerks studio, were shut out – they had to settle for either the two-color Technicolor systems or use a competing process such as Cinecolor. Flowers and Trees was a success with audiences and critics alike, and won the first Academy Award for Best Animated Short Film. All subsequent Silly Symphonies from 1933 on were shot with the three-strip process. One Silly Symphony, Three Little Pigs (1933), engendered such a positive audience response that it overshadowed the feature films with which it was shown. Hollywood was buzzing about color film again. According to Fortune magazine, "Merian C. Cooper, producer for RKO Radio Pictures and director of King Kong (1933), saw one of the Silly Symphonies and said he never wanted to make a black-and-white picture again." Although Disney's first 60 or so Technicolor cartoons used the three-strip camera, an improved "successive exposure" process was adopted circa 1937. This variation of the three-strip process was designed primarily for cartoon work: the camera would contain one strip of black-and-white negative film, and each animation cel would be photographed three times, on three sequential frames, behind alternating red, green, and blue filters (the so-called "Technicolor Color Wheel", then an option of the Acme, Producers Service and Photo-Sonics animation cameras). Three separate dye transfer printing matrices would be created from the red, green, and blue records in their respective complementary colors, cyan, magenta and yellow. Successive exposure was also employed in Disney's "True Life Adventure" live-action series, wherein the 16mm Kodachrome Commercial principal photography element was first duplicated onto a 35mm fine-grain SE negative element in one pass of the 16mm element, thereby reducing wear on the relatively small 16mm element and also eliminating registration errors between colors. The live-action SE negative thereafter entered other Technicolor processes and were incorporated with SE animation and three-strip studio live-action, as required, thereby producing the combined result. The studios were willing to adopt three-color Technicolor for live-action feature production, if it could be proved viable. Shooting three-strip Technicolor required very bright lighting, as the film had an extremely slow speed of ASA 5. That, and the bulk of the cameras and a lack of experience with three-color cinematography made for skepticism in the studio boardrooms. An October 1934 article in Fortune magazine stressed that Technicolor, as a corporation, was rather remarkable in that it kept its investors quite happy despite the fact that it had only been in profit twice in all of the years of its existence, during the early boom at the turn of the decade. A well-managed company, half of whose stock was controlled by a clique loyal to Kalmus, Technicolor never had to cede any control to its bankers or unfriendly stockholders. In the mid-'30s, all the major studios except MGM were in the financial doldrums, and a color process that truly reproduced the visual spectrum was seen as a possible shot-in-the-arm for the ailing industry. In November 1933, Technicolor's Herbert Kalmus and RKO announced plans to produce three-strip Technicolor films in 1934, beginning with Ann Harding starring in a projected film The World Outside. Live-action use of three-strip Technicolor was first seen in a musical number of the Metro-Goldwyn-Mayer feature The Cat and the Fiddle, released February 16, 1934. On July 1, MGM released Hollywood Party with a Technicolor cartoon sequence "Hot Choc-late Soldiers" produced by Walt Disney. On July 28 of that year, Warner Bros. released Service with a Smile, followed by Good Morning, Eve! on September 22, both being comedy short films starring Leon Errol and filmed in three-strip Technicolor. Pioneer Pictures, a movie company formed by Technicolor investors, produced the film usually credited as the first live-action short film shot in the three-strip process, La Cucaracha released August 31, 1934. La Cucaracha is a two-reel musical comedy that cost $65,000, approximately four times what an equivalent black-and-white two-reeler would cost. Released by RKO, the short was a success in introducing the new Technicolor as a viable medium for live-action films. The three-strip process also was used in some short sequences filmed for several movies made during 1934, including the final sequences of The House of Rothschild (Twentieth Century Pictures/United Artists) with George Arliss and Kid Millions (Samuel Goldwyn Studios) with Eddie Cantor. Pioneer/RKO's Becky Sharp (1935) became the first feature film photographed entirely in three-strip Technicolor. Initially, three-strip Technicolor was only used indoors. In 1936, The Trail of the Lonesome Pine became the first color production to have outdoor sequences, with impressive results. The spectacular success of Snow White and the Seven Dwarfs (1937), which was released in December 1937 and became the top-grossing film of 1938, attracted the attention of the studios. One major drawback of Technicolor's three-strip process was that the cameras required a special, bulky, large volume sound blimp. Film studios could not purchase Technicolor cameras, only rent them for their productions, complete with camera technicians and a "color supervisor" to ensure sets, costumes and makeup didn't push beyond the limitations of the system. Often on many early productions, the supervisor was Natalie Kalmus, ex-wife of Herbert Kalmus and part owner of the company. Directors had great difficulty with her; Vincente Minnelli said, "I couldn't do anything right in Mrs. Kalmus's eyes." The ex-Mrs. Kalmus preferred the title "Technicolor Director", although British licensees generally insisted on "Colour Control" so as not to "dilute" the film director's title. She worked with quite a number of "associates", many of whom went uncredited, and after her retirement, these associates were transferred to the licensees, with, for example, Leonard Doss going to Fox where he performed the same function for Fox's DeLuxe Color. The process of splitting the image reduced the amount of light reaching the film stock. Since the film speed of the stocks used were fairly slow, early Technicolor productions required a greater amount of lighting than a black-and-white production. It is reported that temperatures on the film set of The Wizard of Oz from the hot studio lights frequently exceeded 100 °F (38 °C), and some of the more heavily costumed characters required a large water intake. Some actors and actresses claimed to have suffered permanent eye damage from the high levels of illumination. Because of the added lighting, triple amount of film, and the expense of producing dye transfer projection prints, Technicolor demanded high film budgets. Gentlemen Prefer Blondes, an example of Technicolor filming in 1950s Hollywood. Color films that recorded the three primary colors in three emulsion layers on one strip of film had been introduced in the mid-1930s by Eastman Kodak in the United States (Kodachrome for 16mm home movies in 1935, then for 8mm home movies and 35mm slides in 1936) and Agfa in Germany (Agfacolor Neu for both home movies and slides later in 1936). Technicolor introduced Monopack, a single-strip color reversal film (a 35 mm lower-contrast version of Kodachrome) in 1941 for use on location where the bulky three-strip camera was impractical, but the higher grain of the image made it unsuitable for studio work. Eastman Kodak introduced its first 35 mm color motion picture negative film in 1950. The first commercial feature film to use Eastmancolor was the National Film Board of Canada documentary Royal Journey, released in December 1951. In 1952, Eastman Kodak introduced a high-quality color print film, allowing studios to produce prints through standard photographic processes as opposed to having to send them to Technicolor for the expensive dye imbibition process. That same year, the Technicolor lab adapted its dye transfer process to derive matrices and imbibition prints directly from Eastmancolor negatives, as well as other stocks such as Ansco and DuPont color stocks. Foxfire (1955), filmed in 1954 by Universal, starring Jane Russell and Jeff Chandler, was the last American-made feature photographed with a Technicolor three-strip camera. In an attempt to capitalize on the Hollywood 3-D craze, Technicolor unveiled its stereoscopic camera for 3-D films in March 1953. The rig used two three-strip cameras, running a total of six strips of film at once (three for the left eye and three for the right). Only two films were shot with this camera set-up: Flight to Tangier (1953) and the Martin and Lewis comedy Money From Home (1954). A similar, but different system had been used by a different company, using two three-strip cameras side-by-side for a British short called Royal River. As the end of the Technicolor process became apparent, the company repurposed its three-color cameras for wide-screen photography, and introduced the Technirama process in 1957. Other formats the company ventured into included VistaVision, Todd-AO, and Ultra Panavision 70. All of them were an improvement over the three-strip negatives, since the negative print-downs generated sharper and finer grain dye transfer copies. By the mid-1960s, the dye-transfer process eventually fell out of favor in the United States as being too expensive and too slow in turning out prints. With the growing number of screens in the US, the standard run of 200–250 prints increased. And while dye-transfer printing yielded superior color printing, the number of high speed prints that could be struck in labs all over the country outweighed the fewer, slower number of prints that could only be had in Technicolor's labs. One of the last American films printed by Technicolor was The Godfather Part II (1974). In 1975, the US dye transfer plant was closed and Technicolor became an Eastman-only processor. In 1977, the final dye-transfer printer left in Rome was used by Dario Argento to make prints for his horror film Suspiria. In 1980, the Italian Technicolor plant ceased printing dye transfer. The British line was shut down in 1978 and sold to Beijing Film and Video Lab which shipped the equipment to China. A great many films from China and Hong Kong were made in the Technicolor dye transfer process, including Zhang Yimou's Ju Dou (1990) and even one American film, Space Avenger (1989), directed by Richard W. Haines. The Beijing line was shut down in 1993 for a number of reasons, including inferior processing. In 1997, Technicolor reintroduced the dye transfer process to general film printing. A refined version of the printing process of the 1960s and 1970s, it was used on a limited basis in the restorations of films such as The Wizard of Oz, Gone With the Wind, Rear Window, Funny Girl, and Apocalypse Now Redux. After its reintroduction, the dye transfer process was used in several big-budget, modern Hollywood productions. These included Bulworth, The Thin Red Line, Godzilla, Toy Story 2, and Pearl Harbor. The dye-transfer process was discontinued by Technicolor in 2002 after the company was purchased by Thomson. By the late 1990s, the dye transfer process still had its advantages in the film archival community. Because the dye transfer process used stable acid dyes, Technicolor prints are considered of archival quality. A Technicolor print from the dye transfer era will retain its original colors virtually unchanged for decades with proper storage, whereas prints printed on Eastmancolor stocks produced prior to 1983 may suffer color fading after exposure to ultraviolet light and hot, humid conditions as a result of less stable photochemical dyes. Fading on some prints is so rapid that in some cases, after as little as five to ten years, the colors of the print have faded to a brownish red. Furthermore, three-strip camera negatives are all on silver-based black-and-white stock, which have stayed unaltered over the course of time with proper handling. This has become of importance in recent years with the large market for films transferred to video formats for home viewing. The best color quality control for video transfer by far is achieved by optically printing from Technicolor negatives, or by recombining the three-strip black and white negatives through digital means and printing, onto low-contrast stock. Director George Lucas had a three-strip archival negative, and one or more imbibition prints made of Star Wars; this "protection" copy was consulted for color values in putting together the 1997 Special Edition of Star Wars. One problem that has resulted from Technicolor negatives is the rate of shrinkage from one strip to another. Because three-strip negatives are shot on three rolls, they are subject to different rates of shrinkage depending on storage conditions. Today, digital technology allows for a precise re-alignment of the negatives by resizing shrunken negatives digitally to correspond with the other negatives. The G, or Green, record is usually taken as the reference as it is the record with the highest resolution. It is also a record with the correct "wind" (emulsion position with respect to the camera's lens). Shrinkage and re-alignment (resizing) are non-issues with Successive Exposure (single-roll RGB) Technicolor camera negatives. This issue could have been eliminated, for three-strip titles, had the preservation elements (fine-grain positives) been Successive Exposure, but this would have required the preservation elements to be 3,000 feet or 6,000 feet whereas three-strip composited camera and preservation elements are 1,000 feet or 2,000 feet (however, three records of that length are needed). One issue that modern reproduction has had to contend with is that the contrast of the three film strips is not the same. This gives the effect on Technicolor prints that (for example) fades cause the color balance of the image to change as the image is faded. Transfer to digital media has attempted to correct the differing color balances and is largely successful. However, a few odd artifacts remain such that saturated parts of the image may show a false color. Where the image of a flame is included in shot, it will rarely be of the expected orange/yellow color, often being depicted as green. The Technicolor company remained a highly successful film processing firm and later became involved in video and audio duplication (CD, VHS and DVD manufacturing) and digital video processes. MacAndrews & Forbes acquired Technicolor, Inc. in 1982 for $100 million, then sold it in 1988 to the British firm Carlton Communications PLC for $780 million. Technicolor, Inc. acquired the film processing company Consolidated Film Industries in 2000. Since 2001, Technicolor has been part of the French-headquartered electronics and media conglomerate Thomson. The name of Thomson group was changed to “Technicolor SA” as of February 1, 2010[update], re-branding the entire company after its American film technology subsidiary. The visual aesthetic of dye transfer Technicolor continues to be used in Hollywood, usually in films set in the mid-20th century. Parts of The Aviator (2004), the biopic of Howard Hughes, were digitally manipulated to imitate color processes that were available during the periods each scene takes place. ^ "How MIT And Technicolor Helped Create Hollywood". 31 July 2015. ^ a b "1955-1975". Technicolor100, Eastman Museum. Archived from the original on 25 December 2015. Retrieved 4 February 2016. ^ Cinematographic Multiplex Projection, &c. U.S. Patent No. 1,391,029, filed Feb. 20, 1917. ^ "Moving Pictures in Color", The New York Times, February 22, 1917, p. 9. ^ "The first Technicolor film was a total disaster a century ago". CNET. 2017-09-09. Retrieved 2018-06-27. ^ "The First Successful Color Movie", Popular Science, Feb. 1923, p. 59. ^ "Kalmus, Herbert. "Technicolor Adventures in Cinemaland", Journal of the Society of Motion Picture Engineers, December 1938"
^ Los Angeles Times, June 7, 1931, Page C9. ^ Los Angeles Times, June 7, 1931, Page C9; The Washington Post, September 11, 1931, Page 12; Los Angeles Times, July 9, 1931, Page A9. ^ Radio Pictures announced plans to make four color features under the titles of "The Runaround" (produced), "Babes in Toyland" (never produced), "Macheta" (never produced) and "Bird of Paradise" (changed to black and white). ^ MGM announced plans to make The Merry Widow in color and also to rework a revue called The March of Time with a storyline for release. The only Paramount feature that seems to have been announced was a picture called Rose of the Rancho which was to have starred Richard Arlen and Dolores Del Rio. ^ a b "Dye-Transfer Process". Technicolor100, Eastman Museum. Archived from the original on 8 July 2015. Retrieved 4 February 2016. ^ Other studios could then start producing cartoons with the three-strip process, but were still barred from releasing them until 1936. "Technicolor Signs With Disney", The Wall Street Journal, April 17, 1934, p. 10; "Mickey Mouse Falls Under Technicolor's Sway", The New York Times, February 3, 1935, p. X5; Nelson B. Bell, "The New Trichrome Process Is About to Meet Test on Screen", The Washington Post, June 2, 1935, p. SO1. Douglas W. Churchill, "Advices From the Film Citadel", The New York Times, June 9, 1935, p. X3. ^ "Two key advantages to SE as opposed to three-strip photography is that the optical path is far simpler resulting in a single focal plane for each frame, and the alignment of frames from a single strip of film as opposed to three separate records is far easier. This is clearly evident when we are working with our nitrate negatives." Interview with Theo Gluck, Director of Library Restoration and Preservation for Walt Disney Studios Motion Pictures Archived 2009-04-02 at the Wayback Machine, by Robert A. Harris, 2008. ^ "Activities on the Western Front" (PDF). The New York Times. November 5, 1933. Retrieved December 6, 2008. ^ Vincente Minnelli, I Remember It Well, New York: Doubleday, 1974. ^ a b "Chronology of Motion Picture Films: 1940–1959". Kodak. Archived from the original on 13 January 2010. ^ March 14, 1953 "New Technicolor 3-D Camera" BoxOffice Magazine. Page 10. ^ "Dario Argento's Suspiria: A Visual and Aural Masterwork". Indiana Public Media. Retrieved September 29, 2010. ^ a b "1975-2015". Technicolor100, Eastman Museum. Archived from the original on 25 December 2015. Retrieved 4 February 2016. ^ a b c Flueckiger, Barbara. "Technicolor No. VI: Dye-transfer prints from enhanced process". Timeline of Historical Film Colors. Retrieved 4 February 2016. ^ "Untouched is impossible: the story of Star Wars in film". ^ "MACANDREWS & FORBES GROUP INC reports earnings for Qtr to Sept 30". 12 November 1983 – via NYTimes.com. ^ "History of Carlton Communications PLC – FundingUniverse". fundinguniverse.com. ^ "Technicolor - Technology-driven company for Media & Entertainment". www.technicolor.com. Archived from the original on 2006-11-13. ^ Cohen, David S. (January 26, 2010). "Technicolor reinventing itself". Variety. Look up technicolor in Wiktionary, the free dictionary. Technicolor on Timeline of Historical Film Colors with many written resources and many photographs of Technicolor prints.